With Monday being the celebration of Martin Luther King, Jr/’s life and accomplishments, I decided to go back and refresh my memory about his wife and co-worker in the struggle for racial equality CORETTA SCOTT KING. Mrs. King rose from rural poverty in Heiberger, Ala., to become an international symbol of the civil rights revolution of the 1960’s and a tireless advocate for social and political issues ranging from women’s rights to the struggle against apartheid in South Africa that followed in its wake. She was studying music at the New England Conservatory of Music in Boston in 1952 when she met a young graduate student in philosophy, who on their first date told her: “The four things that I look for in a wife are character, personality, intelligence and beauty. And you have them all.” A year later, she and Dr. King, then a young minister from a prominent Atlanta family, were married, beginning a remarkable partnership that ended with his assassination in Memphis on April 4, 1968. Mrs. King has been seen as an inspirational figure around the world, a tireless advocate for her husband’s causes and a woman of enormous spiritual depth who came to personify the ideals Dr. King fought for. “She’ll be remembered as a strong woman whose grace and dignity held up the image of her husband as a man of peace, of racial justice, of fairness,” said the Rev. Joseph Lowery, who helped found the Southern Christian Leadership Conference with Dr. King and then served as its president for 20 years. Some of Coretta Scott’s earliest insights into the injustice of segregation came as she walked to her one-room school house each day, watching buses full of white children stir up dust as they passed. She got her first sense of the world beyond rural Alabama when she attended the Lincoln School, a private missionary institution in nearby Marion, where she studied piano and voice and had her first encounters with college-educated teachers and where she resolved to flee to a world far beyond rural, segregated Alabama. Still, she agreed to meet for lunch the next day, only to be put off initially that he was not taller. But she was impressed by his erudition and confidence, and he saw in this refined, intelligent woman what he was looking for as the wife of a preacher from one of Atlanta’s most prominent ministerial families. When he proposed, she deliberated for six months before saying yes, and they were married in the garden of her parents’ house on June 18, 1953. The 350 guests, elegant big-city folks from Atlanta and rural neighbors from Alabama, made it the biggest wedding, white or black, the area had ever seen. Even before the wedding, she made it clear she intended to remain her own woman. She stunned Dr. King’s father, the Rev. Martin Luther King Sr., who presided over the wedding, by demanding that the promise to obey her husband be removed from the wedding vows. Reluctantly, he went along. After it was over, the bridegroom fell asleep in the car on the way back to Atlanta while the new Mrs. King did the driving. She mostly carved out her own niche, most prominently through more than 30 “Freedom Concerts” where she lectured, read poetry and sang to raise awareness of and money for the civil rights movement. The division disappeared with Dr. King’s assassination. Suddenly, she was not just a symbol of the nation’s grief but a woman very much devoted to carrying on her husband’s work. Exactly how to do that was something that evolved over time. Marching in Memphis was a dramatic statement, but Ralph Abernathy, one of Dr. King’s lieutenants was chosen to take over his movement. But soon she developed her own language and own causes. So when she stood in for her husband at the Poor People’s Campaign at the Lincoln Memorial on June 19, 1968, she spoke not just of his vision, but of hers, one about gender as well as race in which she called upon American women “to unite and form a solid block of women power to fight the three great evils of racism, poverty and war.” She joined the board of directors of the National Organization for Women as well as that of his Southern Christian Leadership Conference and became widely identified with a broad array of international human rights issues rather than being focused primarily on race. That broad view, she would argue, was completely in keeping with Dr. King’s vision as well. And to carry on that legacy, she focused on two ambitious and daunting tasks. The first was to have a national holiday in his honor, the second was to build a nationally recognized center in Atlanta to honor his memory, continue his work and provide a research center for scholars studying his work and the civil rights era. The first goal was achieved despite much opposition in 1983 when Congress approved a measure designating the third Monday in January as an official federal holiday in honor of Dr. King, who was born in Atlanta Jan. 15, 1929. The second goal, much more expensive, time consuming and elusive, remains to this day a work in progress Â and a troubled one at that. When Mrs. King first announced plans for a memorial in 1969, she envisioned a Lincolnesque tomb, an exhibition hall, the restoration of her husband’s childhood home, two separate buildings for institutes on nonviolent social change and Afro-American studies, a library building, an archives building and a museum of African-American life and culture. And she envisioned a center that would be a haven both for scholars and a training ground for advocates of nonviolent social change. To the end Mrs. King remained a beloved figure, often compared to Jacqueline Kennedy Onassis as a woman who overcame tragedy, held her family together, and became an inspirational presence around the world. Admirers said she bore her own special burden Â being expected somehow to carry on her husband’s work and teachings Â with a sense of spirit and purpose that made her more than just a symbol. CORETTA SCOTT KING YOU ROCK! 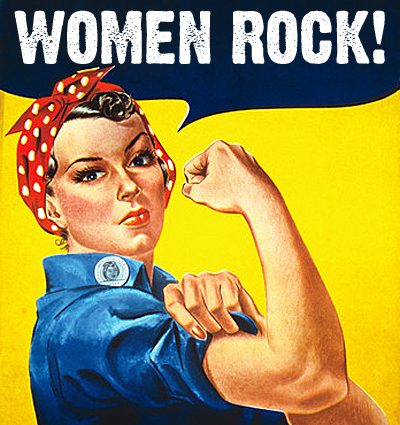 I invite you to share a story about an inspiring woman in the comments section. Just leave us a link to your post. We can never read too many stories about inspiring women. 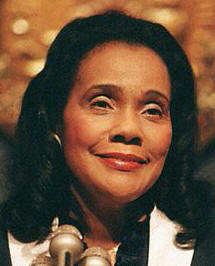 I love reading all your posts on inspirational women but I think Coretta Scott King stands out. Thank you for sharing her story. It seemed particularly appropriate this week. In more ways than one, Bernadette! Sadly for all but the wealthy in America, IMHO. I was at the Univ. of TN when King was murdered (Knoxville, not Memphis – across a rather long state). I was surrounded by black students who were distraught, however, which really brought it home for me. UT prepared for riots which, fortunately, never materialized. America lost the ongoing voice of a remarkable man that day – but gained that of yet another amazing woman in the aftermath. Love these Feminist Friday posts. Thanks especially for this one. I love this series, Bernadette. And very appropriate for this week. This is fabulous. I haven’t heard much about Mrs. King. What an epic woman. An important post, Bernadette, that reminds us to be grateful for loving and committed social justice advocates like Coretta Scott King. It’s up to all of us now to carry on their work in our own ways for the sake of the next generations. I loved reading about Mrs. King, a strong women indeed. Excellent Post Benadette. Learned so much I did not know about this remarkable woman. Thank you for your tremendous support and encouragement. I started this feature over a year ago and didn’t realize how important it would become.